Home Business Commentary Would You Rather? 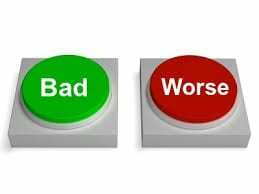 As a kid, my friends and I would play a game called “Would You Rather?” We would give the other person false choices to see which false choice they would make given the worst case scenario. It was all in fun. However, now it seems we are always forced to make horrible false choices. Minorities, the poor and disenfranchised people have to make them more on a daily basis than any other group. False choices include: fast unhealthy food or medicine, electric bill or home repairs, drink unclean water or sugar filled drinks, let your kids outside to breathe unclean polluted air or keep them inside without getting exercise, catch the bus or walk the unsafe streets to work, call out sick without pay or go to work and get everybody in the office sick so you can get a full check, pay a high car note or high car insurance, leave your baby with your sick mom while you go to work or pay for expensive childcare. The list goes on and on and this is not sustainable. More and more people are being forced to make more and more false choices. It has forced people to use their imagination to, as Gladys Knight says “to keep on keeping on”. Many people in our community live on food deserts and are not living close to healthy food choices. These unhealthy foods cause obesity and contribute to the high diabetic rate and issues with cardio health. This in turn causes healthcare costs to rise. When a large group suffers, we all suffer. The issue of unclean water and air are issues dealt with in the 1970’s. The Clean Air and Clean Water Act passed by Congress, under a Republican President, were passed to keep us safe. However a study made last year by Harvard University found black people about three times more likely to die from exposure to airborne pollutants than any other group. President Trump, a Republican, now is removing regulations and proposed cutting the EPA budget by almost 1/3. The EPA has also collected less than 60% of civil penalties collected from polluters. The rich and the affluent are not knowledgeable of the game of false choices. It seems the people in power would not know how to handle making the best of the worst. It is time we share the love. More and more people in the US are dealing with this game which is not a game. It is the reality many of us live in. What are we going to do about it? It is time for us to use our power of voting. We must elect officials to make changes to public policy to eliminate many of these false choices. We must also vote with our dollar and support businesses that support our community. We do have a voice and we must be dedicated to using it.